Columns of Apollo's fallen temple still stand tall against the sky. At the gate of the precinct are three Medusa heads; be careful how you go here. We walk past stone lions and carved bull’s heads and mount the steps of the outer temple. The walls of the inner temple are only a third their original size, but still rise high above us as we go down towards the sacred spring, where the oracle once sang through the vocal chords of an inspired prophetess. Blessedly, there are few tourists at the Temple of Apollo today. Shall I call to him? I decide to take the risk. In the inner temple, facing the sun, I join hands with the friends who have joined me on this expedition and we sing the words in classical Greek that call on Apollo Paian, Apollo the All-Healer, to awaken. I will not transcribe those words here. Some curious German visitors snap pictures. The words reverberate across the enclosure. Sound must have been an essential part of the rituals conducted here. The acoustics are still extraordinary. I am drinking the sun, filling with light and music. A sweet, long-haired redhead – one of the stray dogs you see everywhere in these parts – comes to nuzzle me and lick me, and this feels like a blessing. Pilgrims at the temples of dream healing in ancient times were always hoping for friendly encounters with dogs. I hear great waves of sound, choral voices, musicians. Sound was all-important in the rites celebrated here. I see a giant statue of Apollo at the center of the precinct. On his shoulders appear twin birds, black and white. They are both ravens. Of course: ravens were the birds of Apollo, and his seers use their sight very much as Odin does. Bird-watching was a vital part of divination here. I look through ancient eyes that quartered the sky and attributed different contexts and different outcomes to the behavior of birds in each of these quarter segments. - from my casebook of dream archaeology (September 27, 2012). I am taking one of my favorite dead professors to lunch. 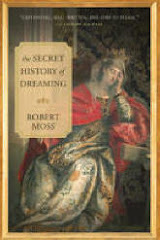 Not the Australian historian, or the Romanian scholar of religions, but a great American ethnographer of the Iroquois who was very generous with his wealth of knowledge and experience when my dreams spurred me to study the traditions and dreamways of the Six Nations. I have the professor take a seat in my kitchen while I call a taxi, giving my street address. I woke from this dream in the early morning light with warm memories of this professor. His name was William N. Fenton, and he was the doyen of scholars of the Iroquois. His field work began in the 1930s, and until just before his death in 2005 his energy for research was unflagging and he continued to produce remarkable books, including his vast history of The Great Law and the Longhouse and a memoir that was published posthumously under the title Iroquois Journey. favorite Albany restaurant, Jack's Oyster House. He talked about fly fishing, about how a Jesuit missionary to the Iroquois at Kahnawake can be considered the founder of modern anthropology and - without any grandiosity - about how he had helped to inspire Edmund Wilson to write his book Upstate. When I talked about my dreams and visions of early America, he confided that he was rather proud that he was a direct descendant of Rebecca Nurse, who was executed as an alleged witch in the infamous Salem witch trials, in 1692. One night Bill and his wife came out to the farm for an intimate dinner party. We stood together in front of a maple with a forked trunk, looking at what appeared to be the shape of a long-haired shaman or sorcerer in the tree. He recalled reading somewhere about a Native shaman whose spirit took up residence in a tree. I told him I had dreamed this, and had written the scene in a draft of a book in progress. Over cognac in my library, in front of a blazing hearth, Bill said to me, "I have never met any man in this century who reminds me so much of Sir William Johnson." Today, after my dream encounter with Bill, I was working with the copy edits for the sections of my new book that describe my "Years of Writing Dangerously" when I embarked on what I thought would be an historical novel about Sir William Johnson and his world in the eighteenth century. I looked closely at all the details in my text, and checked and rechecked my source citations, remembering that Bill was a careful and exacting scholar. I could not resist posting a note on my Facebook page about my encounter with Bill. It drew a wonderful response from a woman named Christine. She reported that "while working on a college project a few years ago, I read so much of Fenton's work that I would have long dream conversations with him. Those dream conversations really helped me create a stronger, more focused presentation." I was eager to clarify whether she dreamed of Fenton before or after his death in 2005. Christine responded, "This particular project, a paper and presentation on Iroquois healing herbs and traditions, was done in 2009, long after Bill died. I spent many hours immersed in my topic, and kept returning to his books - they became a touch stone for what I was doing. In my dreams he would often point out where I needed to expand on my research or concepts that needed to be included. I once jokingly pointed out to my professor that Bill was a much more accessible professor, since I could sleep and work at the same time! "It was in the those dreams that I realized how important it was to discuss the culture and history of the Iroquois, rather than just the herbs, because of the way healing and medicine is embedded in the Iroquois way of life. It was a fascinating project, which I thoroughly enjoyed, and all the more so because the dreams were so vivid. It's been a while since I had one of those dreams now, so please give Bill my best regards!" Christine is clearly a full member of the Dead Professors Society. It is a very special club, but don't go looking for an application form. It is invitation only. Look for the invitation in your dreams. Photo: with my beloved black dogs, at the farm, in 1986. 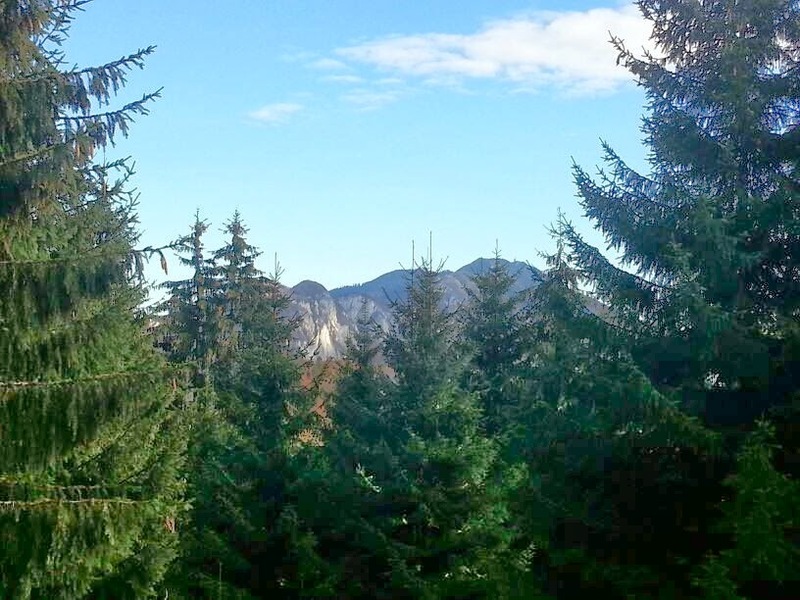 There was great excitement when I announced on the second day of my depth workshop in the Carpathian mountains that that we would make a group journey to heal our relations with the dead, with departed family members and with ancestors further back. There was immense need for this. Many of those present were carrying the heavy energy of the dead, including their addictions. We did preparatory work seeking protection for the journey, clarifying the intention, and developing personal portals. Most people present had dreamed of dead relatives, and such dreams are often the ideal gateways. Going to the graveyard would of course be a classic Romanian entry point; a typical dream shared in the group began “I was in the graveyard again.” I offered a generic scenario for the crossing by water, adding a mist that would clear to reveal a new landscape on the other side. The Black Dog came to guide me while I drummed for the group. I found myself traveling upwards, through many levels separated by what might have been translucent glass. Up above, on the sixth or seventh level, was a man who had arranged his body in some kind of lotus posture. He was wearing an Eastern garment, but I knew at once that this was Mircea Eliade, the great Romanian writer and scholar of religions. He had been dead since 1986, but that was no obstacle to conversation, since I had also left my body, in part of my consciousness. “What are you doing like that?” I asked him. recognized the word, and remembered that Eliade had devoted years to study, practice and writing about yoga and Eastern traditions. The word (I looked it up later) literally means “the Lord who looks down upon the world” and is used in Buddhism for a certain kind of bodhisattva. He obliged, taking on the semblance of a professor with glasses in a fairly good suit with a vest. He told me that the biggest regret of his life was that he had failed to become a bestselling novelist. That was his great ambition. Becoming a world scholar of religion was his second choice. He still nursed that regret. He counseled me not to miss my own opportunity to write new fiction that will seize a wide audience, drawing on my travels between the worlds. He urged me to read all of his fiction, and his journals from the time when he was writing fiction. I should re-read “The Gypsies” and feel free to borrow from its plot and techniques. I allowed that I might do this, but only when safely off the road, at home. He changed appearance again. 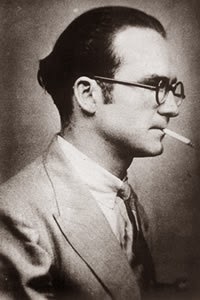 He became the young Mircea (“Murr-shah”, he corrected my pronunciation), a wild young man who made many mistakes, chasing women and rubbing shoulders with Iron Guard fascists. He did not regret going among women – he had life in him – but he felt bad about his early associations with the far right. He indicated that if I ever came across some memento of the Iron Guard and could bury it on his account, he would be grateful. This would lighten his burden. Next day, I led our Romanians into the Magic Library. I wanted to resume my conversation with Mircea, so I transported myself to the used bookstore just off a busy square in Bucharest where I found an anthology containing his story “The Gypsies” in October 2012. The place seemed even dustier and moldier than before, the noise of traffic and construction outside even louder, and I sensed Mircea insisting that if I wanted a meet, I must choose a more salubrious setting. I thought of the Oriental Institute of the University of Chicago, where he was professor of religion. I was instantly transported to a room of Mesopotamian antiquities. I found myself in front of a marvelous Assyrian statue of a god of water. The carved stone streamed, like water, all down his body. Mircea appeared in a sport jacket. He now had some very specific research leads for me. He explained the significance and the location of a porphyry column that had featured in one of my dreams overnight. He suggested a book project that excites me; it will involve rewriting an ancient myth. I will not say more about that until I have worked on it. I researched the Assyrian water god in the Oriental Institute and made a wonderful discovery. He is a guardian figure from an ancient temple of Nabu, god of writing and knowledge. He holds a vessel from which four streams of water flow. Two streams rise over his shoulders to flow down his back, Two flow down the front of his garment to his feet. A superb image of creative flow, associated with a god of writing. Yes, this was the right place to discuss new book projects. Now I am doing the first part of my assignments: reading and re-reading Eliade, especially the fiction, the memoirs, the journals. In his twenties, full of ideas that were bursting for expression, and a constant need to pay for the next meal or the next consignment of books, he wrote in a frenzy. He wrote from 2 PM to 8 PM, and again from 11 PM to 3 AM or later until his body was exhausted and his creative springs ran dry. In the first volume of his Autobiography, I found this passionate statement of creative will: "Nothing, absolutely nothing, can sterilize spiritual creativity so long as a man is - and realizes himself to be - free. Only the loss of freedom, or of the consciousness of freedom, can sterilize a creative spirit." Today I re-read "The Gypsies." This story is quite edgy for me. I read it for the first time on a plane from Bucharest to Warsaw a year ago. I found it profoundly disturbing and disorienting. In the story, a man is drawn into a strange house that belongs to gypsy witches. Later, he is unable to find his way back to the time and place he came from. Twelve years have flown by; nobody knows him. They won't take his money on the tram because the currency has changed. When he stumbles back to the house of the gypsy girls, we get the impression that he has crossed into a land of the dead. With an anthology containing this story in my hand, I embarked from Bucharest airport a year ago full of good cheer. My journey rapidly devolved into craziness and confusion. Stranded overnight at Warsaw's Chopin airport thanks to a canceled connection, I found myself fog-bound in the morning and reached a point of desperation when I wondered whether I would ever be able to find my way home. There are stories that take possession of your reality. I found my way back, significantly, by working with elements from a half-forgotten dream. In the anthology of Romanian Fantastic Tales translated by Ana Cartianu (Bucharest: Minerva, 1981) that got me into trouble in October 2012, Eliade's story "La Țigănci" is simply titled "Gypsies". In the translation by William Ames Coates reprinted in Tales of the Sacred and Supernatural (Philadelphia: The Westminster Press, 1981) it is given the fuller title "With the Gypsy Girls". Russian fantasy scifi writer Sergei Lukyanenko has turned his Night Watch trilogy into a pentalogy, with publication of a fifth volume, New Watch, following a fourth, Last Watch, that appeared a few years ago. New Watch is not yet in a U.S. edition, but I placed an order for the Heinemann edition from the U.K., because this is an author I like to follow. The previous books in the Night Watch series seized me with an urgent need to go from one volume to the next without drawing breath. Lukyanenko’s theme in the Night Watch series is one of the eternal ones that is never out of date: the battle of Dark and Light. The Night Watch is composed of Light Others who keep the Dark side in check. Office hours are 20:00-8:00. The Day Watch consists of Dark Others who monitor and run interference on the Light. Office hours are 8:00 to 20:00. In Moscow (where much of the action takes place) the style of both is like that of hard-drinking, somewhat seedy secret agencies of the Russian government. The only non-drinkers are the vampires of the Day Watch, who can’t metabolize alcohol. The Others live much longer than humans and have the power of seeing and traveling through a world-behind-the-world known as the Twilight. The Others are described and graded as magicians. Only magicians of the higher levels can see or travel below the first and second levels of Twilight. We eventually learn that there are seven levels of twilight, but not even Gesar and Zabulon – Higher magicians and chiefs of the Night Watch and Day Watch, respectively - can go there. The protagonist is Anton Gorodetsky a Light watchman with a sympathy for vampires and a girlfriend/wife (Sveta) who is a notably more powerful magician than he is, even after he becomes a Higher magician in book three (Twilight Watch). Light and Dark Others are monitored by the Inquisition, also known at the Twilight Watch. The inquisitors are drawn from both Watches and their job is to police the rules of the treaty that is supposed to prevent the balance between Light and Dark from being overthrown. In book three Dark and Light must combine to fight forces inimical to both. The plot centers on a book long held to be mythical – the Fuaran – that contains the secret of how to turn humans into Others. If all humans are turned into Others, the Others will cease to exist. We are given to understand that the most powerful magicians are actually those with the lowest personal energy, sucking in vitality from the humans all around them. In book four, we learn that the magician with absolute power is the “zero-point” magician, an interesting idea. I like the way the Others enter into twilight by “pulling up their shadows”. This becomes banal in the movie version of Night Watch when they put on dark glasses, like Neo in The Matrix. I wish the film crew had spent a moment considering how to film the act of stepping into your own shadow. Sometimes, in unpropitious conditions, the only shadow available to Anton is the shadow of an eyelid. A wily adversary in book four (Last Watch) places himself in front of the window, preventing Anton from casting a shadow he could use to see into the twilight. On the first level of twilight, the world goes gray apart from the “blue moss” which feeds and thrives on human emotions, especially fear and lust. Some structures appear as they do in the ordinary world, but leached of color and substance, so an Other can step through them. 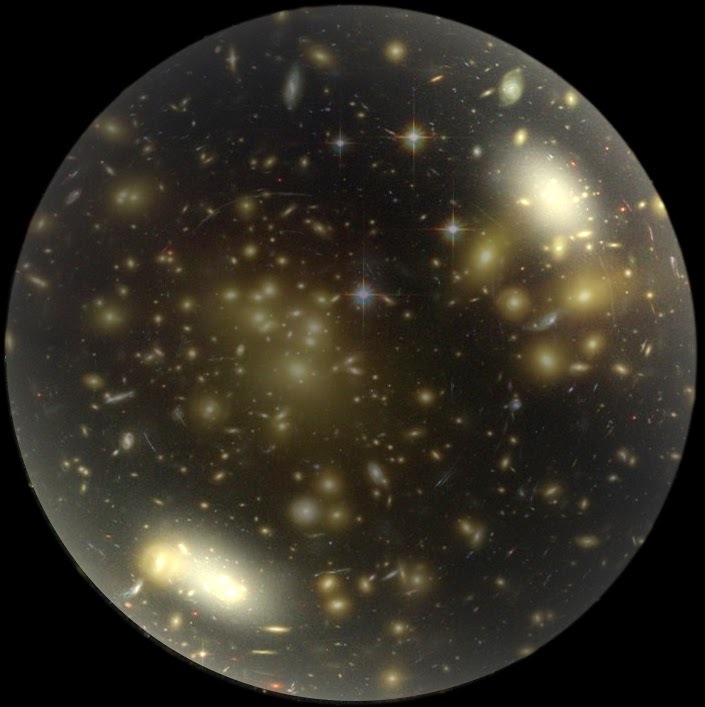 At the second level, the world is grayer and emptier, and travelers shed their normal appearance. The deeper you go, the more you risk losing your vital essence and the harder it is to come back. But higher magicians can practice rapid teleportation by diving through deeper levels of the twilight. On the fifth level, you learn the terrible truth about the Others – that they gain their power by stealing it from humans, as air rushes to fill a vacuum. "I have lost my universe," he told me. I said, "I know a place where you can find it." He gladly accepted the map I gave him. I told him a gray shaman with a gray wolf would be waiting for him. The map brought him to the gate of a walled market. Fierce gatekeepers blocked his passage. He would not be allowed to enter until he put down his weapons. 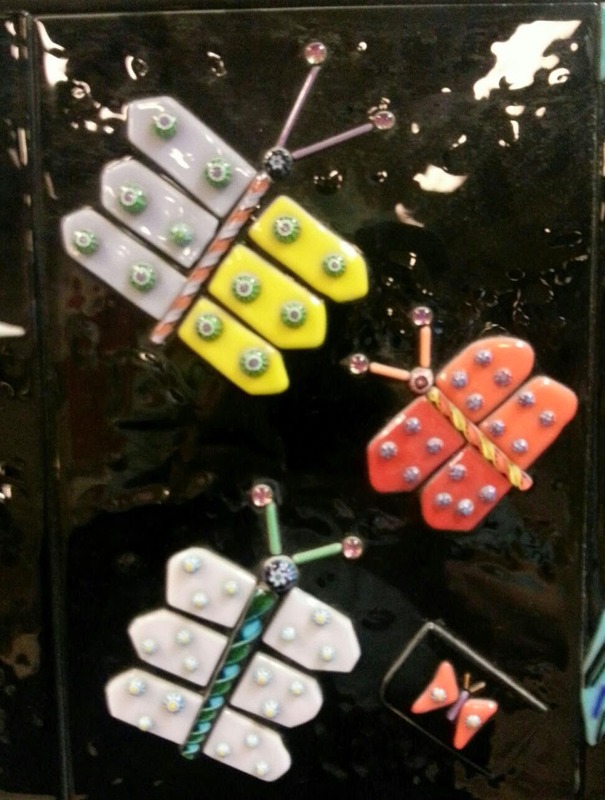 He saw these as a sword, a dagger and a shirt of chainmail. Lighter, unarmed, he offered a prayer because the armored giants at the gate also seemed like angels. He crossed a drawbridge and entered a narrow passage that brought him to a market full of life and color. It seemed to contain all the riches of the world, yet safely contained and well organized within its four walls. He passed piles of grain and put handfuls in his pocket. He chose two apples, green and golden, at another stand, munched them as he walked, then kept what was left. He came to a stall in the market that was full of familiar things, toys and games from his childhood. He picked up a model plane and remembered how he had treasured this and been hurt when his parents gave it away without telling him. He threw the plane into the air, aiming at the far wall of the market. A opening appeared in the wall the exact shape of the plane, then the bricks of the wall fell apart in a complex pattern and a gray horse - an Arabian - trotted out. He got on the back of the horse and it treated him to a show of dressage before it galloped across an open space and became airborne. From the horse's back he looked down over islands. Each one contained a wealth of knowledge. He came to an island mountain whose peak jutted above the clouds. A great tent witith a pointed top had been set up for the reunion he was about to attend. A gray shaman was waiting for him on the mountain. He wore a soft gray robe with a hood, fastened by a simple cord. At his side was a gray wolf who looked a bit like a Husky dog. The shaman asked, "Why have you come?" He said, "I have come because I have lost my universe." "Why do you need a universe." "Because I feel I have important work to do, work that will help others. I feel I may even be worthy to become a teacher. But I cannot do this while I am living in a place of shadows." The gray shaman reached under his robe and brought out a stone ball he had hanging from his belt. He placed it in the seeker's palm. "Here is your universe. It has been kept safe. How you open it and what you will find in it are things that are up to you. You will find what your courage and imagination allow you to find, as you make this your daily practice. "You cannot heal the body without healing the soul." The first time this statement is recorded is in a dialogue of Plato called the Charmides. The source of the quote is Zalmoxis, described as a "Thracian" god king who had established a unique school of soul healing. Zalmoxis was actually Dacian, and for the past four days we have been building a temple of soul healing in his country, now called Romania. We succeeded in journeying as a group on Saturday to his "palace of light upon the world" in an extraordinary collective experience that brought through tremendous light energy. The journey began when I invited the members of our circle to go on a walk in the woods, up the steep slopes of the mountain behind our villa. I told them they would find a wounded animal along the trail. They would follow it through the mountain mist to a blue lake where the animal would be healed in the waters. They would follow its example and plunge as deep as they needed to go for their own healing. They might find that the blue lake opened into another world. At the end of the drumming, a woman named Gabriela electrified us with her travel report. She started out up the forest trail, in the dappled sunlight. She saw something sparkling among the fallen leaves, then realized it was blood. She looked for a wounded animal and saw in the distance what she thought was a white eagle, a bird that had been her ally in the past. The message came, "Look closer, please." She looked again, and found the animal was a black mountain goat. She found it was injured in many places. The deepest wound was in the heart. When she reached out in an effort to help, her hand came away dripping with blood. Despite its wounds, the goat ran up the mountain, and she followed it, into deep fog in which she lost her bearings for a while. When the fog cleared, she saw the goat hurling itself into a blue lake. It was submerged for a long time, and she became worried it would not come up again. At last it surfaced and bounded away on the far side of the lake, apparently healed. Gabriela jumped into the lake. She feared she was drowning, then found she could breathe underwater. A guide she had met in previous journeys appeared to her and asked, "What do you want?" She replied, "I want to see." "Then open your eyes." She opened her eyes, deep underwater, and saw a clearing in the forest, in another world. Drumming sounded from the clearing, and she approached the source. She found shamans in animal masks and skins drumming and dancing around a great fire. She joined them for a time, then understood that she must go into the fire. When she stepped through the fire in the lake, she found herself in yet another world. 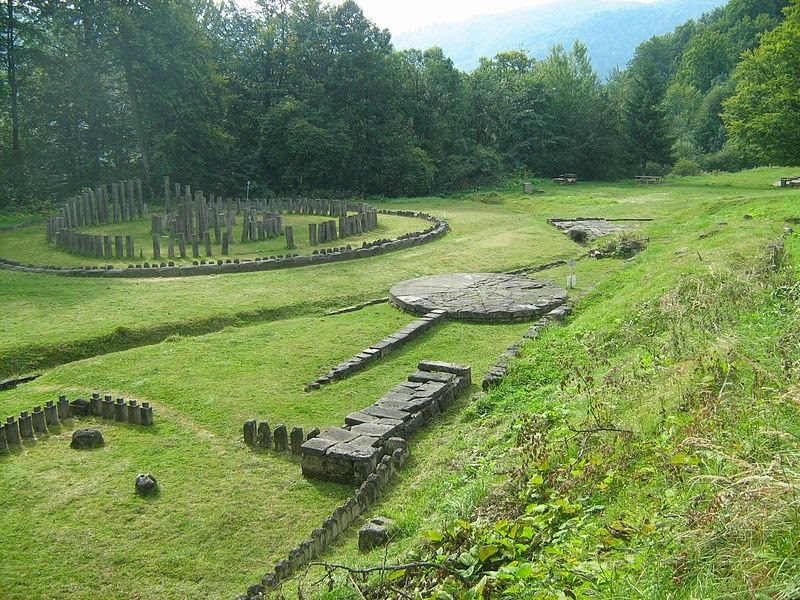 She recognized Sarmizegetusa, the ancient capital of the Dacians, not in ruins but as it may have been at its apogee. She was drawn to the temple of Zalmoxis. It was blazing with light. She approached an immense being of light, and knew she was in the presence of Zalmoxis. "I knew him by his righteousness, by his light energy, by his endless desire to heal." Zalmoxis asked her, "Why have you come here?" "I have come to be healed." "Why do you wish to be healed?" The question shook her. She thought for a moment, then said, "I want to be healed so I can draw and make art. My drawings are my way of traveling." She felt that her response was accepted. She felt him encouraging her to step outside herself and look at her body from another perspective. She felt compassion, observing her body and noticing what it had endured. The god told her, "You must bring a gift to your body." She did not understand how to accomplish this until he gave her a further instruction, "Bring colors to your body." She felt a rain of light descending and saw it entering her body, streaming to the heart, where it coalesced and became a shining green crystal. From the green crystal at the heart a rainbow of colors radiated out, bringing specific but uncalculated healing energy to every part. We were all seized with excitement by Gabriela's vivid report. With her permission, I took the key elements from her journey and turned them into a travel plan for our whole group. We would journey together to the city of Zalmoxis. We would find our personal responses to the question, "Why do you want to be healed?" - and they would need to be creative responses. We would seek the source of that tremendous light energy, and bring its gift to our bodies in a rainbow of colors. The group journey was extraordinary. 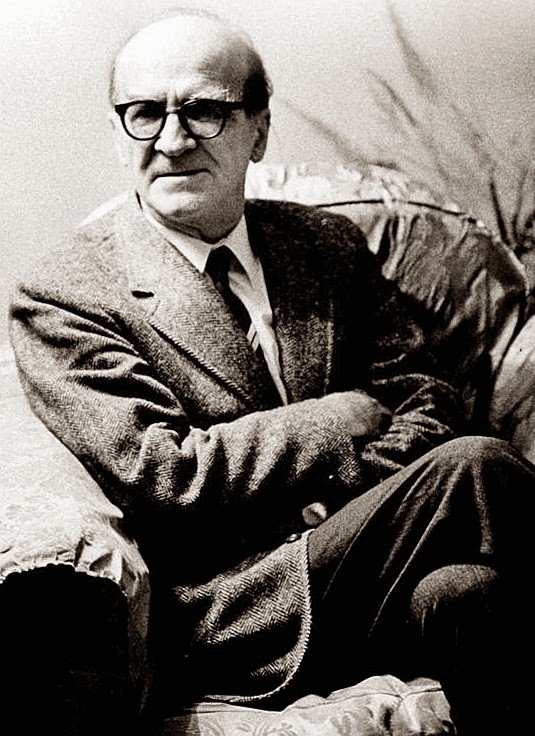 I was now able to understand why Mircea Eliade told me (in a vision the previous day) that what is written about Zalmoxis in the Charmides is more important than the world understands and that even in his own immense research he had only began to scratch the surface. I believe we succeeded, as dream archaeologists, in traveling to the city of Zalmoxis and in experiencing something of what became available in his school of soul healing. The etymology of the name of that city, Sarmizegetusa, is uncertain. There are at least three versions. I like the version that gives its meaning as the Palace of Light Upon the World. That is where we found ourselves in our group journey. After the final drumming, we stood in a circle, letting light energy flow hand to hand. We became a great wheel of light, as light burst from our hearts and streamed to the heart of our circle. We called down more and more light to the heart of our circle and sent it out to those in need. We started the day by singing for the Bear in Romanian. By the end of the first drumming, our meeting room was full of bears. They danced through the dreams and visions that were shared throughout our first day. "I am out in the forest, high in the mountains. I feel a great wind blowing on me. It is strange but good. It lifts my spirit. I see a rider dressed in furs. His horse is covered in furs as well. I have the impression he is a part of myself. A huge bear comes from the mountain, standing on two legs. He wants me to follow him." "I heard a little girl calling, 'I'm here! I'm here!' I looked for her and found her inside a cage, with a little bear cub. I was so sad because I recognized her. She was part of me that I lost in childhood. Then a great mother bear came and stood behind me, giving me the strength to free her from the cage. I took her and the bear cub into my arms and felt them come into my heart." "I saw a little ballerina, turning pirouettes. A bear came and she clapped her hands with joy and soon they were dancing together. I was happy because I know the little ballerina is part of myself and that now the bear is here she feels safe with me and is coming home." We did not merely talk about such dreams and visions. We turned them into theater, we danced them, we journeyed with the help of shamanic drumming through the portals they provided. The vision of the fur clad rider and the standing bear gave us the gateway for an extraordinary group adventure. As I drummed, we felt that strange wind rising. With my second sight, and then with all my inner senses, I found myself in front of a giant bear. This was not one of the forms of the Bear I know well, and have worked with in many places and in many ways. It was a Carpathian brown mountain bear, and we were making our first acquaintance. The mountain bear gripped my shoulders and leaned its great head over me. I felt an edge of fear, because it could easily break my neck. Though part of me was inclined to step back and take my distance, I willed myself forward. I pressed my second body into the heart of the bear. It opened like a door. I entered a mountain cave, which led into many other caves. They were full of children and bear cubs. I understood that this was a place of Lost Boys and Lost Girls, waiting to be restored to those who have suffered soul loss, and also a place to restore full connection with the animal spirits. I was grateful for that moment of fear. It was one of those moments that removes any doubt that what is happening in nonordinary reality is altogether real. It gave necessary edge to the day, and prepared me to help others who were experiencing fear or doubt on the edge of claiming the power that was waiting for them. "There was a bear at the door of my house. I was trying to keep it out, to keep the door shut. Then I heard it up on the roof, trying to get in through a window up there. People who were in my place would not help. The bear came down through the roof window. I ran through my apartment, trying to get away. Nobody seemed to understand what was happening. the bear caught me and held me and licked the side of my face like a dog. Ugh. It was disgusting." We laughed when we heard her response when the bear revealed that it was her friend. I noted that her voice, in that moment, was the voice of a child self. She laughed when one of our dream players pretended to lick her face. After sunset, I drove with friends through the fir woods to a hostelry in Poiana Brasov called Coliba Haiducilor; the name is a Romanian equivalent of Robin Hood and His Merry Men. We were greeted at the door with cups of warm palinka, and ushered through rooms that were a vision of abbondanza, with great jars of home-made pickles, dried fruits and vegetables, alembics of distilled spirits, sides of smoked meat, bottles of Romanian wine, some dusty from many decades in the cellars. We dined heroically on traditional Romanian fare and survived strolling players with an accordion. Towards the end of our feast, the lights went down for a moment and shouts carried across the high-beamed hall. "The bear! The bear! The bear is extraordinary!" The voice was that of the head waiter, encouraging guests who had just arrived to try bear steaks from the game section of the menu. It was definitely time to leave. Though I love Bear, I don't eat bear - precisely for that reason. I sat out on my balcony at the mountain villa where we have gathered, under a night full of stars. I thanked the bear of these mountains for opening its heart to the heart of soul healing. A white bat flew by, between me and the fir trees. Hey, this is Romania. 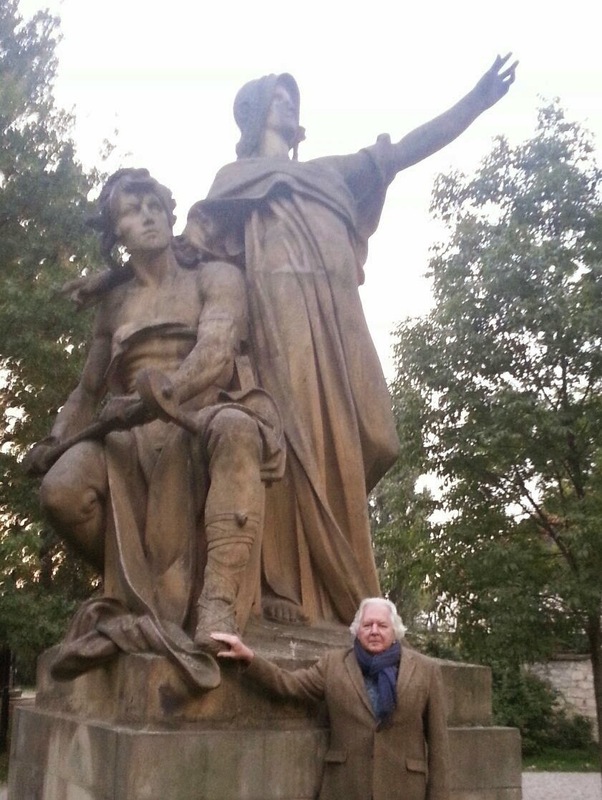 Here she is, in bronze, with the plowman she dreamed she would marry, up on a plinth on Vyšehrad, one of the seven hills of Prague, and a very special sacred site for the Czechs. She is Libuše, one of the three daughters of the legendary king Krok. Her sister Kasi had the gift of healing; her sister Teta had the gift of magic; Libuše's gift was that of the seer, to be able to see at a distance, across time and space and across dimensions. The legend has it that she was chosen to rule after her father's death, but men would not put up with a queen who rules alone. She would have to marry and govern as her husband's consort. She said she would marry, but only one man, a plowman she had seen in a dream or vision. The councilors who would go out to look for him would know him by his sandals. They were made from the inner bark of a tree, and one of them would seem to be broken. To help the search party, Libuše would send her white horse ahead of them. In the story, the plowman is discovered. His name is Přemysl. He abandons his fields to go with them to Libuše's castle on Vyšehrad, and together they found a dynasty. The legend was playing in my mind as I set off for Hora Říp, a round hill in the center of he Czech Republic that was once an active volcano. According to another legend, the origin of the Czech people lies here. An "ancient father" named Czech climbed this hill with kinsmen coming from the east, had a vision of a land of milk and honey, and founded a settlement. The people and the country take their name from him. The approach to the hill of Říp, rising above the deep morning mist, began with a long walk up a road lined with linden trees. 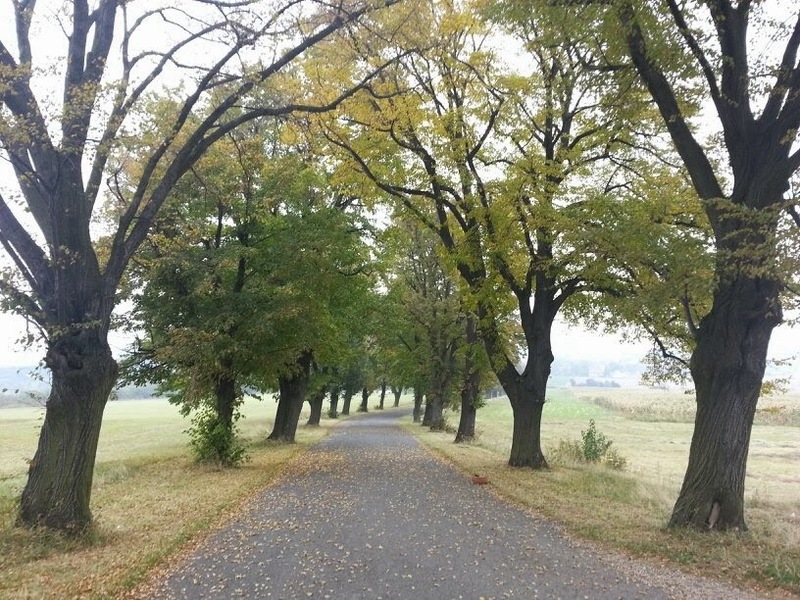 The linden is the sacred tree of the Czechs; there was a linden at the center of every village. Above the boulevard of lindens, the path rose steep and rough. At the top was a rotunda, an old Romanesque chapel. I sat on a bench nearby and drummed for the spirits of the land. Almost immediately, a couple appeared to my inner sight. They were dressed like royals of a long time ago, perhaps from the early Middle Ages. They wore simple crowns. The woman's flowing dress was fern green and the gold decoration of the collar evoked ripe ears of corn. She word a necklace of red stones the color of strawberries. A voice spoke in my mind, an inner soundtrack. It was telling me that the legend of Libuše and her plowman, as commonly told, is incomplete. Přemysl's employment is no lowly estate; he is the chosen consort of a goddess of the land, and through their sacred marriage, he will plow and fertilize the Earth to bring new abundance. His sandal is not broken. It hangs loose because he is an adept at traveling in and out of the body, a walker between worlds. When Libuše sends her white horse, riderless, to find him, she is projecting one of her own forms. Like Epona, she can be seen on a white horse or as a white horse, a favorite avatar of goddesses of the land in Old Europe. The next day, I followed the course of the Berounka river to Tetin, where a hill with marvelous views of the river valley is named after Teta, the magician sister of Libuše. I saw elements of her story in a vision here. I knew Teta for a fierce proud woman who would not easily yield what belonged to her and might be ready to take things she wanted - such as a man - from others. I sensed a third location, a hill of Kasi, the healer, that is not identified in the maps or (so far as I know) in the folklore. Three faces of feminine power, perhaps three aspects of the Goddess of the land. Clues for further dream archaeology. She came to my Shamanic Dreaming workshop because (she told us) she was seeking to find and follow the paths of her soul. She embarked on all our journeys with courage and high enthusiasm. What was quite unexpected, and life-transforming, was what happened when she accepted an invitation to visit the Magic Library. This is a real place in another order of reality, one I often call the Imaginal Realm. It is a realm of true imagination. Palaces and temples and schools and pleasure gardens are constructed here through creative interaction, and they may be visited by prepared and invited travelers over centuries or millennia of human time. The traveler I wish to celebrate picked a used bookstore that she loves, in her native city in another part of Central Europe. When she went inside the bookshop (as she told me) she found that a wall of books "peeled back", revealing a garden behind. "Your story is about a Lost Girl," he responded. "When you were very young, a tree faery took part of your spirit because you world was not safe. Ever since then, the tree faery has kept that girl safe, inside a tree you know." The druid proceeded to identify the tree, and the park where it stands in her native city. She remembered the tree, and the park, very clearly from childhood. "You must go to that tree and retrieve your Lost Girl," the druid instructed. She promised she would do that, as soon as possible after she goes home. We discussed how, in Celtic folklore, people often sing to bring a soul back home, sometimes from a tree where it has been sheltered is is perching like a bird. She readily agreed she would sing for her Lost Girl, at the tree from her childhood, to entertain the faery and prove that she was ready to be a lively host for her child self. I am eager to hear the next installment. For instructions on how to access the Magic Library, which I sometimes call the Secret Library or the Dream Library, please see Dreaming the Soul Back Home. Two ravens, up in the branches of the Soul Tree. One black and one white. They want me to go down to a place in the Lower World where cleansing and healing is needed. I will travel this time under their wings. We go down through the roots of the tree, down and down, to an immense field of the dead. Countless bodies are lying here, many of them thrown on top of each other in mountainous piles. What is to be done with all these bodies of people slaughtered and abandoned, over all the centuries of war and invasion here in the Bloodlands? The ravens know. I hover with the great pair, black and white, over the field. At their command, under their directions, thousand of black ravens flock to the field. They tear at the corpses, stripping meat and sinew from the bones. They gorge until all the corpses have been stripped to the bones, which gleam white and clean in the sourceless twilight of this realm. Now something rises like steam from the bones. A great vaporous cloud, light gray, becoming lighter and more diaphanous as it rises. It is collective spirit that is rising, released from the unhappy dead. I am seeing something that Alfons Mucha tried to paint, in "Apotheosis of the Slavs", the final painting in his magnificent and harrowing series of giant canvases, the Slav Epic: a kind of resurrection of Slavic spirit. I am awed, and seized by sudden hope for the collective healing that may be possible here in the broken heartlands of Europe. I feel an urgent need to commune with the Goddess of these lands. She has shown herself to me in many forms. Here and now, she reveals herself in a primal form. The vast slopes of her body look like bread dough - like a loaf of bread, big as a mountain, that is shaped but not yet baked. What is the breakage of human tides to her? Blood and bone, blood and bone. All the bodies, buried, burned or unburied, have made her more fertile. She lives, she rises, she will give ripe harvests. I resolve to go out into the country, when my workshop is over, and make an offering to the Goddess of this land. What can a man offer the Earth Goddess? Only the return of her gifts. Bread and beer and honey. - My experience while leading a group journey into ancestral realms in my Shamanic Dreaming workshop in Prague this weekend. 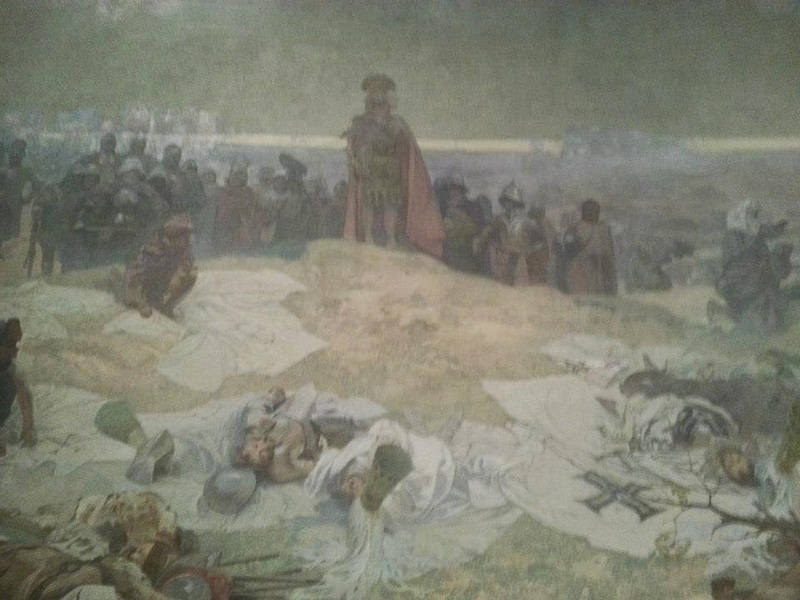 Detail from Alfons Mucha, "After the Battle of Grunwald" currently on exhibit at the National Gallery in Prague. Photo by RM. I first came to Prague a few years ago, for a day of R&R between leading workshops in Lithuania and Romania. I found the city beautiful, but was soon exhausted by the immense crowds of tourists trooping about after tour guides hoisting little flags and umbrellas. I fled the mob at the castle for a quiet section of the Royal Gardens next door. It was there, as I loitered in the shade of a linden tree, listening to the gentle plashing of a fountain, that a young woman greeted me with the question, "Have you met Arthur?" I turned and found that Arthur was an owl, perched on her falconer's glove. An eagle owl, to be precise, very large and strong. She invited me to meet Arthur's companions, raptors rescued by her volunteer service, which had several of them available for meet-ups in a small area off the gardens. I met an eagle, a hawk and a little merlin falcon, which reminded me that the Merlin of legend is also a shapeshifter who - in one account - retired from the world into an "esplumoir", which is where a falcon goes to grow back its feathers. The raptor rescuer also proved to be a dreamer, and I cherished our half hour of talking the language of dreams, and of birds. Today I walked the Royal Gardens again in the middle of the day, prior to opening my first program in Prague. I enjoyed sticking my head under the splendid fountain in front of the Belvedere to hear why it is known as the Singing Fountain. I admired the Deer Moat below the castle, and enjoyed a glass of red wine from the Wenceslas Vineyard at a table overlooking the city and several of its seven hills. But my great pleasure was to chance upon a sign for the raptor rescue area. Different birds, and different volunteers, were there today. I was glad to see them, but I missed Arthur. I was on my way back into the Gardens when I saw him - or his double - on a wall at the back, well away from the visitors. I moved as close as I could without jumping the barrier, and we gave each other a long look that ended with what I chose to take as a sign of recognition. Nice to be welcomed back by a friend who can see in the dark. May your day be filled with light. Günaydın. This is what you literally say when you use this most common Turkish term for "Good morning". May what you do be easy. Kolay gelsun. May it bring you abundance. Bereket versin. A waiter or shopkeeper may say this to you when giving change. The health of your soul. Caninin sağliği. When asked if you want anything else, for example in a restaurant or store, you might say this. May your hand be healthy. Eline sağlik. You might say this to a person who cooks for you, before, during or after a meal. Or to someone who has written or crafted something you like. There are wonderful phrases evoking what is going on when feeling demons - spirits of rage or jealousy - are loose. My jinns gathered around my head. Cinlerim tepeme üşüştü. You might say this to explain how you lost your temper. To become an ifrit, Ifrit olmak. (An ifrit is much scarier than a jinn). Someone in this condition has lost it big-time and let something crazy bad take over the house. Of a clever and crafty person, you can say, "Forty foxes are wandering in his head." Kafasinda kirk tilki dolasiyor. Let's talk about can. I am stirred and delighted by all the Turkish expressions that speak of soul. The word for soul is can, pronounced "jahn" (the Turkish letter C, without the cedilla, is always pronounced as J.) I know of no language where "soul" is so widely mentioned in everyday expressions. An ambulance is a "soul saver." When you first water a new plant in the garden, you are giving it "soul water". Your true friends are "soul company." Built into the language is the shamanic recognition - derived from the early ancestors of the Turkic peoples - that soul can be lost and reclaimed. If you have been deeply hurt, you say "a piece of my soul left". If you are returning to health and balance, you say, "my soul is coming back to its place." There is the "soul friend", can dostu. When "soul is taking place" (can alici yer) it means you have come to the most sensitive point in a situation. Can evi, the "soul's home" is the heart and also the heart of the matter. If you are "taking and giving away soul" (can alip can vermek) you are in great pain. When your "soul is beating for" (can atmak) something, you have a great desire for it. When something moves you, it "touches your soul". If something turns you off, it "bores your soul. "A state of well being is "soul health" (can sağlığı). Your soul has a place on my head. Can baş üstüne. When you say this, you mean you will so whatever has been asked of you with great pleasure. To step on the soul's vein. Can damarına basmak. Careful: This can mean either to touch the heart of a matter, or to push someone's buttons - or both. To hit the soul's home. Can evinden vurmak To hurt someone where he is most sensitive. To have no soul left. Can kalmamak. Exhausted, completely beat. His soul is in his pocket. Can cebinde. Weak person. His soul is strong. Ceni pek. Strong person. To burn someone's soul. Can yakmak. To torment or cause pain. A piece of my soul left. Canımdan can gitti. Used to describe great pain or fear experiences at a certain time. Turkish people say, "A piece of my soul left because of...[at such a time and place]"
The soul market. Can pazari. This is a dangerous time when everyone is out for himself.. Soul is coming back to its place. Cani yerine gelmek. Regaining health and vitality. Turkish food is great, so perhaps it is no surprise that the Turks say "soul comes through the throat" (can boğazdan gelir), encouragement to eat well. Gardeners will love the Turkish phrase for the first water given to a new plant in the garden. It is called can suyu, "soul water." If I want to tell you that you did good, or you are the best, I might say to you, Canina rahmet! "Grace to your soul!" May your soul be alive! Canın sağ olsun! Don't worry!